As 2019 approached, I prayed, journaled, and contemplated about my new word for much longer than usual. This time around it felt different. I had an idea of what I wanted to accomplish, and already had a few projects planned for the first quarter. I just couldn’t seem to find a word to fit. Several candidates came to mind, and I even thought about using Rest for another year, but it just didn’t feel right, it actually felt too small. I began to feel like Goldilocks. Some words were too small, some were too big, and there was one word that felt just right, but also rather scary, so I fought against it for quite a while. To say 2018 did not go as planned is an understatement. Over the last half of the year I felt off-kilter and struggled to find a new normal, after some health issues came to light that left me exhausted and limited my normal schedule. Then there was the web design part of my business that was going through massive transitions with software and technical challenges that gave me more than a few gray hairs. So the idea of pick a Big Word was scary to me. There’s nothing wrong if you don’t have your word picked out by January 1st. But it felt like it based on all the great word ideas I scrolled past on my phone. Seeing the progress people had already made me feel like I was behind already. In the back of my mind I knew I wasn’t behind, but the fact was that I was struggling with finding my word. As a result a false sense of urgency began to grow. Since it was the beginning of the new year, I felt a pressure to get going, get moving, and just pick one already. Then there was the added paralyzing thought of, “What if I pick the ‘wrong’ word?”. I felt behind. Even though I wasn’t. I felt stuck. I felt like I couldn’t continue to plan or commit to a project until I had my word figure out. Talk about silly, but there it was. Thankfully two women, who I consider to be “mentors-from-afar” reminded me of a few things I already knew but needed to hear again. Lara Casey of Cultivate What Matters has a fantastic goal setting series at the beginning of each year that I really enjoy. And her quote, “There’s nothing magical about January 1st” was exactly what I needed to hear. Then came Jennie Moraitis of LittleGirlDesigns.com, and she reminded me that your word of the year is not set in stone, you can always change it. Isn’t it funny how you can know something, but it takes someone else saying it for it to sink in? With these two reminders, it was time to stop stressing over not having picked a word yet. It was time to stop using it as an excuse not to plan and work on the projects already on the calendar. Why in the world would you want to put that much pressure on yourself? Crazy yes, but we do it anyway, don’t we? Just because you are needing to dig a little deeper and longer than someone else you see on Instagram does NOT mean you are doing it wrong or that there is something wrong with you. It could be that you (and I) just need more time and there is nothing wrong with that. At one point I had to ask myself, what happens if I don’t have a word or it doesn’t get picked until much later? What is the worst that can happen? Thing #3: Try one on for size, run with it, change it later if you need to. There were three solid candidates on my list for a week or two. My poor sister probably got a series of texts, some on the same day, sometimes only a few hours apart, with a new declaration of what my word of the year was and the reasoning behind it. Your word of the year is not set in stone – it’s okay to change it. Decide on one for now and start working it. If it works, great! If not, try the next on your list, until you find one that works for you. One word per quarter? Great! One word for the first half of the year and new one for the second? Go for it. It’s important to take regularly schedule times for personal reviews to check in on your goals, projects and your word of the year. Take stock of where you are and make adjustments as you go along. You may find that the word still fits or find your focus needs to change. Change it up. I can’t tell you how much I fought against this word. First because it came from Lara’s series on goal setting and the word cultivate is her brand and business name. I felt like I was cheating by picking “their” word. Secondly it felt so big and “marathony” and “long haulish”. I don’t naturally think that way. But as she continued to talk about the word, and the more I thought about it, it just fit. It stuck with me and annoyingly wouldn’t leave me alone. As I examined what projects I already had planned, habits I needed to develop for my health and schedule, not to mention my vegetable and flower gardening plans, I realized I was looking at list of projects and ideas that would need to be cultivated and nurtured over a long period of time. That helped me understand why the word fit and my decision was finally made. With that decision made, my ideas and projects changed and grew. This new Selah Reflections Journal idea came out of deciding to pick something, try it on for size, and run with it for a while. Will it be the word I carry throughout the year? I think so, but if not, I’ll pick a different one to focus on. In the end, I’m grateful that my word was finally chosen, it just took a lot longer than usual to find it. Going through this experience made me realize that I was putting too much pressure on myself, to the point of halting progress on my current projects. 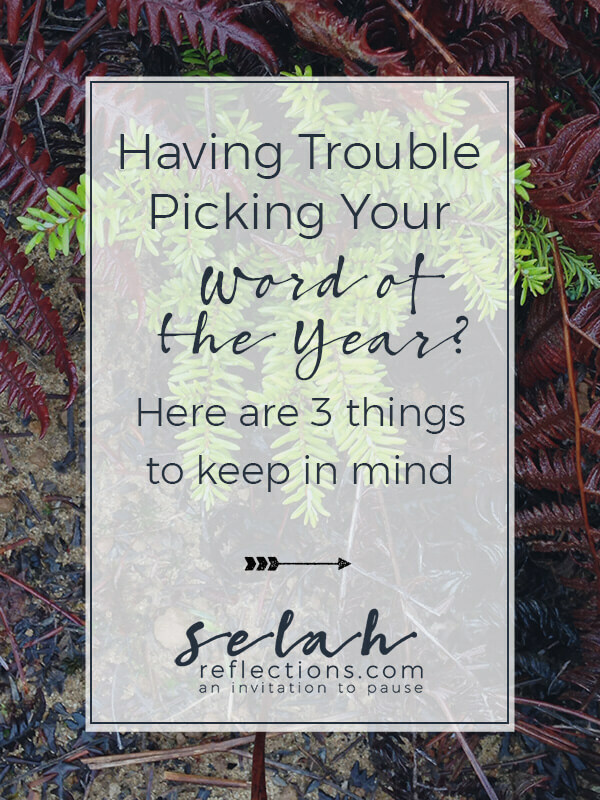 In fact, I believe it was through intentionally releasing the pressure of picking the perfect word, or any word, that made all the difference in helping me choose a word. So, my 2019 Word of the Year is Cultivate. It feels hard fought and hard won and I’m looking forward to continuing to discover more about this word and watch it take shape. And if all goes well I’ll be sharing pictures from my flower garden later this summer! Did you a pick a Word of the Year? I’d love to hear about it, your plans, and why you chose it.